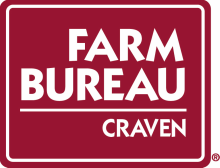 The Craven County Farm Bureau Women’s Program is very active in many areas; from agriculture legislation and safety programs to agricultural education. Our ladies strive to promote agriculture within the county and across the state. ​Their overall goal is to inspire other women to be involved with Farm Bureau and promote activities that not only promote agriculture, but that also increase peoples’ awareness of Farm Bureau. © 2015 Craven County Farm Bureau. All Rights Reserved.